This pocket-sized dictionary presents current and correct notation practices in an easy-to-use format. 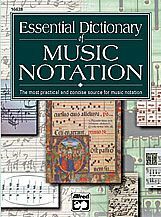 Generously illustrated and concise, this book is essential to any musician looking for a handy reference for the correct notation of music. A most welcome and beneficial source for every musician, whether using a pencil or a computer.